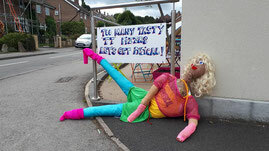 Get creative and make a scarecrow for this years competition. All crows must be out and in position by 9am on Wednesday 15th August. No entry fee, prize to the winner and spot prize drawn from all entrants. Grab a map and go on a hunt around the village to find all the scarecrows! This competition runs from Wednesday 15th to Friday 17th August. Entry forms for both competitions are available from the village pubs, Hackney House Gifts & Café and also 73 Springfield Road and The Old Post Office, Millcross Lane.